HACCP (Hazard Analysis of Critical Control Points) is a management system in which food safety is addressed through the analysis and control of biological, chemical and physical hazards. HACCP training educates participants about this systematic approach to hazards that can compromise food safety and teaches them how to reduce these risks to a safe level. Establishing an HACCP system is critical to your compliance with national and international legislation. What Does HACCP Training Include? The HACCP system meets the requirements of the Codex Alimentarius Commission established by the FAO and WHO to set codes of practice and internationally recognized standards pertaining to food, food production and food safety. The commission’s main goals are to protect the health of consumers and ensure fair practices in the international food trade. HACCP also can be used to fulfill governmental requirements (FDA/USDA) and to support the requirements of Global Food Safety Initiative standards such as SQF, BRC, IFS or FSCC 22000. Our course is an accredited HACCP course by the International HACCP Alliance. On site training is available for groups of 7+. Please contact us for more details. Price per person – $499 (5% off for 3 or more participants, 10% off for 5 or more participants) – Price includes training materials and certification fees. 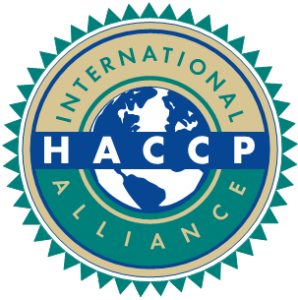 Who Should Attend HACCP Certification Training? Individuals responsible for controlling or overseeing safety in food production should attend the HACCP training course, but any employee who works with food can benefit from becoming certified. Some employees with an eye on food-service careers choose to get their HACCP certification to gain additional job opportunities. Some business owners prefer to have key individuals in the workplace obtain HACCP certification training as well. We provide training courses at various times of the year — either at your location for groups of seven or more, or at our training center in Naperville, Illinois. Check out the dates above to find the class offering that works with your schedule, and register through the link provided. Our HACCP course is accredited by the International HACCP Alliance and meets all HACCP requirements. Our 16-hour course takes place over two days and costs $499 per person. This price includes both training materials and certification fees. A discount of 5 percent is offered for groups of three or more participants, while groups of five or more will receive a 10 percent discount. If you are interested in HACCP training in Chicago, reach out to us for further information. Cancellation Policy: Payment must be received prior to the start of the class. Cancelation within 10 business days before the start of the class – 50 % refund will be issued. Cancellation within 5 business days before the start of the class – no refund will be issued however replacement person may be sent to the class. Cancellation for classes with closed registration – no refund will be issued. Credit cards and checks are accepted as a form of payment.